The Marder (German for “marten”) saw service as a series of makeshift tank destroyer designs produced by Germany during WWII. Antitank cannons were fitted on various chassis, with the Marder III being based on the Czech 38(t). The Marder III Ausf.H (Sd.Kfz.138) mounted a 7.5cm PaK 40 cannon on a rear-engine Panzer 38(t) chassis, with stowage of 38 rounds for the main armament. A fighting compartment was positioned in the center of the tank destroyer. Because it was mid-mounted, this compartment had a lower profile, though there was still only room for two men to stand. Armored shields protected the gun crew to the front and sides only. A total of 418 vehicles were produced up till April 1943. 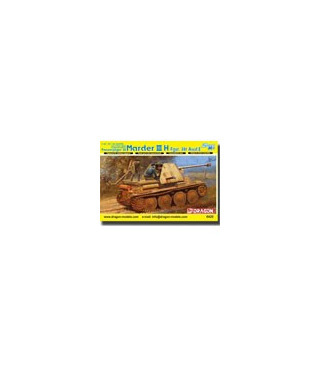 Dragon is offering a fine 1/35 scale plastic kit of the Marder III Ausf.H. As a Smart Kit, it has been carefully engineered to build into an accurate model that is easy to assemble for modelers of all skill levels. The engine deck is an all-new molding, and a movable gun travel lock is affixed to it. What’s special about the engine deck is that two side-opening hatches can be displayed open or closed to reveal the engine compartment. For inclement weather, Dragon has incorporated a newly tooled canvas cover for the fighting compartment. This is made of DS and possesses a realistic texture. This authentic-looking item gives an option for modelers to show their Marder III H in a dramatic winter setting. The realistic basket frame at the rear is also newly designed, with the complex cage shape made from a preformed metal component or modeler can assemble it with the original plastic as another option. The fender-mounted storage box is also made from photo-etched metal. The gun barrel is available as a slide-molded plastic part, or a bonus aluminum version can be used instead. This Marder III H comes with an array of extras such as ammunition (both spent cases and full rounds), as well as open and closed ammo tubes. This kit has been well thought through, and will allow modelers to create an extremely realistic kit of this special tank destroyer that fought effectively on a variety of fronts.